“This is just a pointless festival,” is what it says at the top of the official Prague Pride webpage this year. Is someone being facetious? Yes. To those involved with Prague Pride, it is anything but pointless. The theme of this year’s festival is “tolerance does not equal respect”, and you can find a thought-provoking essay on that subject if you scroll down the page a bit farther. According to the article, a common point of view among Czechs is that, since gay, lesbian, bi, and transexual people are not imprisoned or losing their jobs here because of their sexual orientations, and that they are generally tolerated, then to have a festival of this nature in Prague is kind of pointless. However, festival organizers this year are urging society at large to go beyond simple tolerance of the LGBT community in the Czech Republic, and to grant people of all sexual orientations and gender identifications the same respect and freedom to be themselves that is usually only enjoyed by the heterosexual majority; the message being that “tolerance” is for things which are unpleasant or not right in some way but which people put up with anyway, and that respect and acceptance is what all people ought to be giving to all other people and allowing them to live their lives in their own ways without any attached stigma, that being queer in some way is a completely valid and respectable lifestyle choice that shouldn’t require some sort of societal “tolerance”. Visit Prague Pride on Facebook. 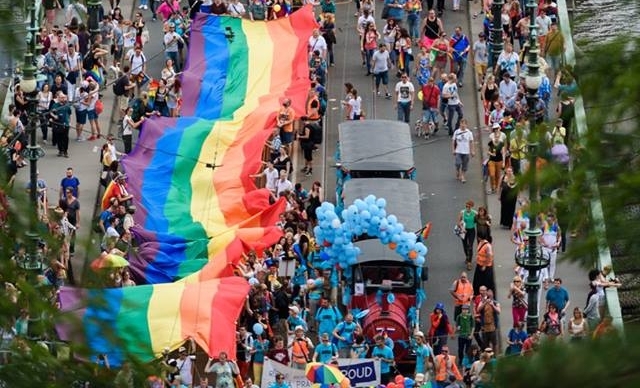 The Prague Pride Festival is a relatively new phenomenon in this country. The first Prague Pride happened as recently as 2011, making this year’s celebration only the seventh, and the annual festival which takes place every year in August has been quite successful in less than a decade, attended by both locals and people from all over the world who travel here for the occasion. Scattered resistance and some bad-mouthing of the cause by right-wing politicians and pressure groups hasn’t put a damper on anything. It’s a great week-long party which offers a large variety of cultural events, forums, films, seminars, and club extravaganzas, with its climactic event being Rainbow Saturday. At 11:30 Saturday morning, 12th August, people will begin gathering on Wenceslaus Square to get ready for the big parade which, beginning at 12:30, will make it’s way to Republic Square and then along the river bank before crossing over to the other side, climbing up to the metronome, and moving through Letná Park and finishing there at 14:00, followed by an afternoon and evening of DJs, dancing, food, fun, and general frolic. Definitely a good time for all involved, the Prague Pride is one of the best summer events the city has to offer. So go out and enjoy yourselves there in whatever way you see fit. Click here for a full calendar of events for Pride week 2017.